Practicing good oral hygiene and avoiding tobacco and some foods often helps people with bad-smelling breath. You may want to try using a tongue scraper to clean food from your tongue. You could also just brush your tongue with your toothbrush. But if doing so doesn’t seem to help or if you always need mouthwash to hide bad breath, talk to your dentist. Surveys by the American Dental Association and Oral B® reveal that 7 in 10 respondents 65 years of age and older visit their dentist at least once a year and almost all said they believe that healthy teeth and gums are important. It’s great to know that seniors are concerned about their oral health, because dental needs change as we age. Unfortunately, cavities are not just for kids. All throughout our lives, carbohydrate-containing foods team up with bacteria in the mouth to produce cavity-forming acids. Seniors often have receding gums that expose the sensitive roots of the teeth to cavities. These cavities should be filled as soon as possible to avoid further damage to the teeth. Seniors should try to brush teeth 2-3 times a day and floss at least once daily. To reduce the risk of cavities, it is recommended to use fluoride toothpaste and a mouth-rinse containing fluoride. Periodontal disease or gum disease is the main reason people lose their teeth. Gum disease is caused by plaque, a bacterial film that continuously forms around the teeth. Although gum disease is often painless until it is very advanced, some signs of gum disease include: bleeding gums after eating or brushing your teeth, persistent bad breath; swollen gums; loose teeth; a change in the fit of partial dentures; or permanent tooth loss. The effects of gum disease become cumulative as we age. And as much you participate in maintaining a healthy mouth, only your dentist or hygienist can clean the plaque and tartar under the gum line to help reduce the damage of gum disease. As with cavity prevention, daily brushing and flossing are essential. Regular dental cleanings and dental exams are important. Seniors with gum disease should see their dentist 3-4 times a year, regardless of your insurance coverage. Seniors who have worn dentures for many years may find that they don’t seem to fit as well anymore. Loose dentures make it difficult to eat and speak (they seem to make a “clacking” noise), and do not support the face as well. This is going to be a result of bone recession. Your dentist can sometimes remedy the problem by relining the denture, but a new denture should be made every 5-7 years, or when the dentures cannot be used comfortably. If we can be of help, please don’t hesitate to contact us. Check on the tongue side of teeth and look for a receding gum line. Or has the gum that used to fill the gap between your teeth opened to the point that now there’s a dark void between your teeth. These are signs of your gum recession. In addition, you’re really not too old to have sealants painted on your teeth. Apparently, oral health care during pregnancy is often misunderstood by treating physicians and their patients. Every pregnant woman should be screened for oral risks, educated about proper oral hygiene, and referred to a dentist where treatment may be necessary. Dental procedures such as periodontal treatment, restorations, and extractions are safe and are best performed during the second trimester. We are hesitant to perform diagnostic radiography regardless of the accepted practice that it’s safe. Xylitol and chlorhexidine may be used as adjuvant therapy for high-risk mothers in the early postpartum period to reduce transmission of cariogenic bacteria to their infants. Appropriate dental care and prevention during pregnancy may reduce poor prenatal outcomes and decrease infant caries. Every pregnant woman should be assessed by a dentist for dental hygiene habits, access to fluoridated water, oral problems (e.g., caries, gingivitis), and continued access to dental care. Patients should be counseled to perform routine brushing and flossing, to avoid excessive amounts of sugary snacks and drinks, and to consult a dentist. Many dentists are reported to be reluctant to treat pregnant women, but shouldn’t be. Optimally, physicians and dentists can overcome this situation through education, clear communication, and the development of ongoing collaborative relationships. Physicians should share information on the safety of dental treatment in pregnancy with dental colleagues and provide clear referral recommendations. If we can be of service please feel free to contact us. Alpharetta Dentist: Clark Howard or Real Oral Health Care? In response to Clark Howard’s opinion on dentists and mid-level providers, he’s dead wrong or could be. And he doesn’t understand the sector of patients who do and don’t seek to have proper oral health care. If Mr. Howard had a heart-attack today, price of care would be the last thing on his mind. Would he negotiate before they installed the stint or after? His perspective is steeped in ignorance. The answer is not as Mr. Howard would suggest, devoting energy and time and money to creating a lesser trained dental provider to deliver a poor approximation of comprehensive dental care (in Georgia). This opinion comes from the lack of understanding of what a dentist is trained to do. Clark Howard is living back in the 20’s, the 1820’s, where the only thing a dentist did was pull teeth and cut hair. A recent example in our office was the discovery of suspicious cells on the underside of the patient’s tongue. Ultimately (and hopefully), our discovery and recommendation will save this patients life. Our early detection of cancer comes from years of (university) training and experience that transcends the old view of what a dentist does for that 15 minute examination during your regularly scheduled hygiene appointment. Contrary to your physician’s health care, the cost of delivering dentistry is under constant pressures from the free market system and yet when adjusted for inflation the cost of delivering dentistry is the same cost it was in 1982. The answer to providing adequate and broad based oral health care lies in educating patients about the value of good oral health, who can best deliver the care, and how consumers can obtain and maintain that care. Marred by an old view of dentists and dentistry, Mr. Howard is stuck in a mindset that all dentists do is just drill-and-fill. There is much more to the art and science of dentistry than Clark Howard is remotely aware. Our society needs to understand the need to regularly maintain their oral health and that dental care for them and their families is not optional. We need to instill in our society the need to maintain an oral health care regimen and visiting the dentist is a part of that regimen. I find it interesting that Clark Howard wants to put you in a position where you bargain for your health care needs. Where he fails in his advice is to differentiate between oral health care and retail dentistry. With regards to the specific point of creating mid-level providers as has happened in Alaska, census data demonstrates that 43% of our “public” health care providers aren’t busy because patients don’t show up for their appointments. This is not a lack of dentists, rather a lack of utilization of the care available. While there is no empirical evidence as to ‘why’, one would speculate it is because like Clark Howard, a large portion of the public fail to value the real benefits to oral health care. Take a credible, but uninformed spokesperson like Clark Howard, and the notion that all dentists do is drill-and-fill and we, as providers are starting 10 yards behind the starting line. The real solution is better patient education. If we can answer your questions or you have comments, please feel free to weigh in on this matter. This isn’t to suggest that we as a discipline of health care aren’t competitive. The free market system has kept dentistry fairly moderate in terms of cost compared to the annual leaps in insurance coverage and physician/hospital care. Your smile is our top priority. Drs. Scheinfelds, Orland and Tourial are committed to making your visit a comfortable and valued experience. We know your smile is about more than just your teeth, so in delivering the right smile, we deliver state-of-the-art dental care with a gentle, concerned personal touch. From general dentistry to cosmetic dentistry to in-house prosthodontics, endodontics and implant placements, we provide you and your family with comprehensive, affordable and high-quality care. Make an appointment now or give us a call for more information. Together we can help you achieve the right smile of your dreams. Call for a complementary consultation. If we can be of service or answer any of your concerns please contact us. It seems to be prevalent in that most dentists these days are calling themselves ‘cosmetic dentists’, when in reality there is no cosmetic specialty in dentistry. All dentistry is cosmetic. It’s just some dentists are trained to do it better than others. I don’t know anyone who took the ‘ugly’ teeth class in dental school, because obviously, tongue in cheek, it doesn’t exist. Regardless, the fact remains that the majority of dentists are general dentists and call themselves self-ordained ‘cosmetic dentists’. They all have undergraduate degrees with either a BA or BS and at least four years of dental school with either a DDS or a DMD. But not one of them has a ‘cosmetic specialty’ in dentistry. Those dentists who choose to make the claim do so by virtue of deciding to focus on cosmetics in their general practices. The American Dental Association (ADA) recognizes only nine post dental degree specialties and cosmetic dentistry is not one of them. The closest post doctorate degree to a ‘cosmetic dentist’ specialty is prosthodontics. Of the 170,000 dentists in the U.S. only 3,200 are trained prosthodontists. Of those Forbes magazine estimates 560 are practicing prosthodontists. The so called ‘cosmetic dentists’ take short continuing education courses together with trial and error to create what a prosthodontist is trained to do in their ADA sanctioned post graduate work. The prosthodontist is trained for 3 years at a university to create the smile that implements the use of veneers, crowns, bridges and now the standard of care procedure of dental implants to ensure that the right smile is achieved both functionally and aesthetically. If anyone has a specialty in cosmetic dentistry, it would be the prosthodontist. So when you are seriously looking for a cosmetic dentist, look for a pro, a prosthodontist. ADA sanctioned means at a University. 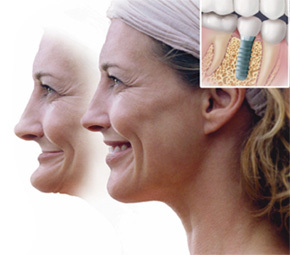 The dental implant is actually a replacement for the root or roots of a missing tooth. And like tooth roots, dental implants are secured in the jawbone in a process known as osseo-integration. Hidden beneath the gum-line, they are used to secure crowns (the parts of teeth seen in the mouth), bridgework or dentures by a various design means. They are made of titanium, which is lightweight and strong, but most importantly, they are bio-compatible, which means that it is not rejected by the body.